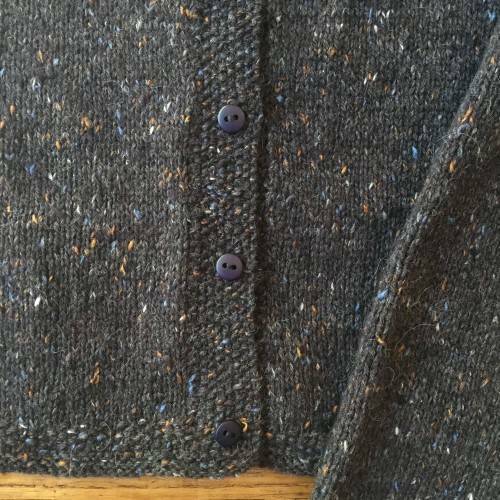 One of life’s perplexing questions is how to do a good job when a cardigan pattern instructs you to “evenly space” the buttons on a button band. Patterns tell you to do it, but they don’t tell you HOW to do it. I’ve developed a way of doing it. I’m not saying it’s the best way, but it works for me. Maybe it will help somebody who is stuck on this final phase of a cardigan–when you’re so close to the sweet finish, but tempted mightily to put off that even spacing chore and cast on something new. OK. So you have a button band. The pattern usually tells you how many buttons to put on this button band. Let’s say that number is 7. Before doing any calculations, place the top and bottom buttons. 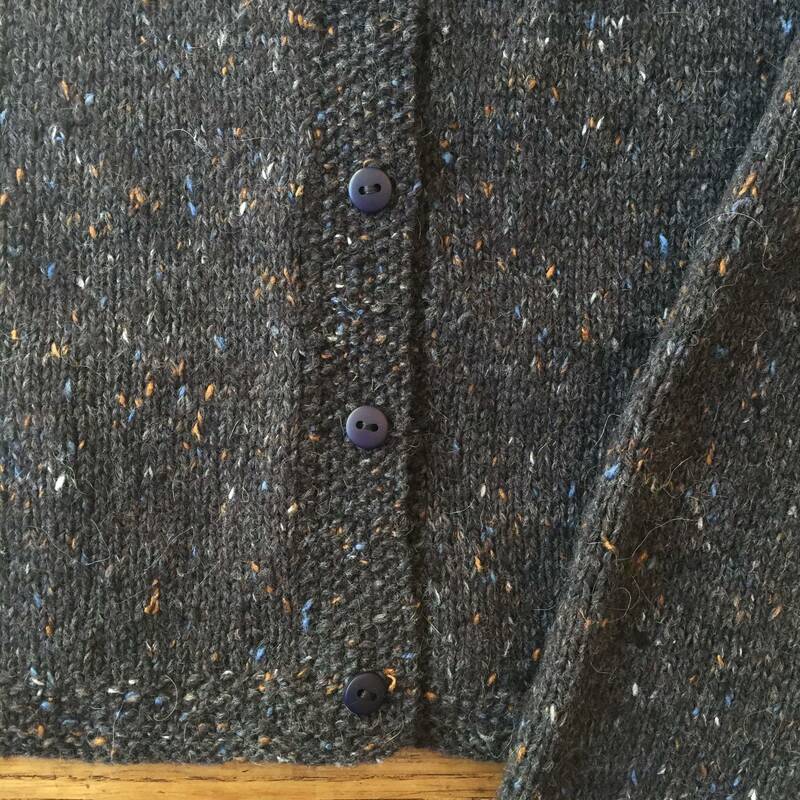 If there is a neckband, you can center the top button in the neckband, or you can place it a half inch (ish) from the top edge of the button band. Put it where you think the top button should be. 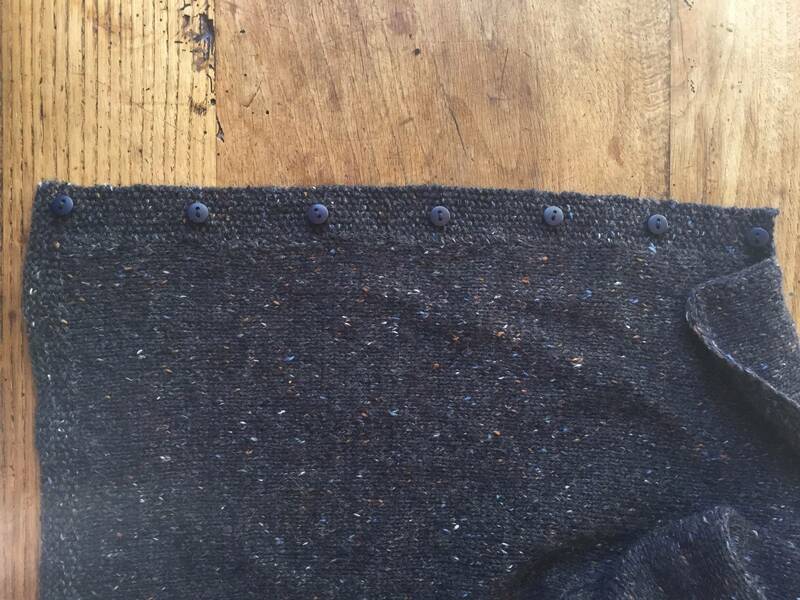 For the bottom button: if there is ribbing or other edging at the bottom edge of the cardigan, center the bottom button in this edging, or place it a half inch or so from the bottom edge. Mark these placement points with a locking stitch marker or safety pin. Place the pin/marker carefully in a specific row of the button band (not between 2 rows or over 2 rows). Now all you have to do is figure out how to evenly space out the remaining 5 buttons between the top and bottom buttons. Count the number of rows between the top and bottom buttons. This is easy to do. Just count them. The number of rows is A. The number of buttons is B.
Subtract B (number of buttons) from A (number of rows), to get C.
Divide C by the number of spaces between the buttons (B + 1). The result is the number of rows between the buttons. For practice, let’s do this calculation on a button band where there are 65 rows between the top and bottom buttons. The first equation is A minus B equals C. In our example, that’s 65 minus 5, so C equals 60. What if your button band doesn’t come out with a neatly divisible number of rows? In our example, if the number of rows on the button band were 67 instead of 65, after subtracting 5 we’d have 62, and after dividing 62 by 6, we’d have a remainder of 2 extra rows. (Shout-out to my fourth grade teacher, Mrs. Tyler!) Here’s where you have to fudge a little by distributing those 2 extra rows in a not-noticeable way. With only 2 extra rows, I’d put 1 extra row in the space below the top button and one extra row in the space above the bottom button. If I had 4 extra rows, I’d place one in each of the center spaces and not in the top and bottom spaces. Knitter’s choice: as long as you’re not putting all the extra rows in a single space, it’s not noticeable. You can use the same method to space the buttonholes on the buttonhole band. Instead of place a pin on the 11th row, you work the buttonhole in that. Hope this is helpful. If anybody has a more straightforward way to do it, I’m all ears! PS Don’t forget to sew on the buttons once you’ve figured out the spacing–this is another dangerous Project Procrastination Point! Avoid! Avoid! A finished sweater is just around the corner! Excellent hints for a chore that no one looks forward to tackling. One other thought: if you have a rather large “front porch”, it’s important to position a button at the bust point. The bust point is the apex of the bust. This keeps gaposis from setting in if the cardigan or jacket is buttoned. Sometimes this will mean that the number of buttons might need to be adjusted. Thank you so much for the helpul post. The Front Porch Rule is a very good rule for those blessed with a veranda. Thank you! 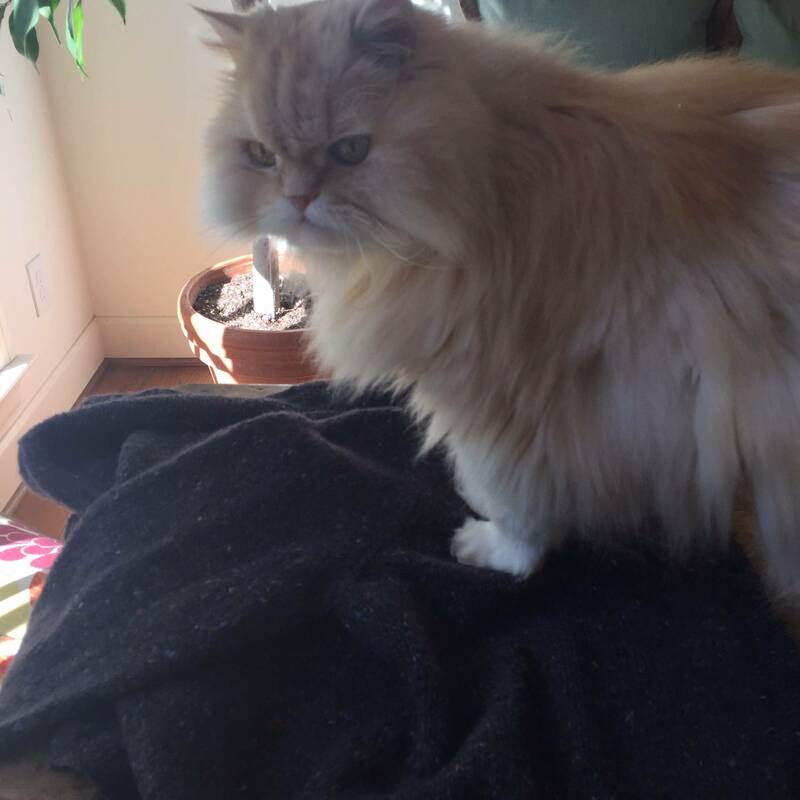 In all my years knitting, I’ve never knit a real cardigan, but I have many in my queue. I need to file this tip away (including Urbanite’s Front Porch Rule), so I can find in when I really do take the plunge! Thanks! I am so glad the blog is back! I avoid patterns that require buttons. In part because there are too many types of buttons to choose from and picking just one makes my eyes cross. It’s sewing on the buttons that makes me consign the cardigan to its little project bag and never finish it. If they are not sewn on at the right point the cardigan will “hang funny.” You see a fair number of “hanging funnies” on Ravelry. I basically make open cardigans as a result. Thanks for the tips! I have a cardi that is all done except for the buttons themselves. I even bought really cute ones. Why can’t I get up the gumption to sew the blasted things on?? Thank you for the warning about actually sewing the buttons on. I have a sweater in button-hole purgatory. I found a way to get them sewn on faster though – I’ve bribed others to do it for me! Thanks for a great instructional piece; it is always heartening to hear that experienced knitters have problems with patterns too! I absolutely love this sweater. Is there any way you can give the source of the pattern? I’m pretty sure that is Olive from Rowan 26, the cardigan that Kay was Knitting for Ann (and just finished). Well, I’m late to the “button band party”, but here’s what I do: Sew the top button and bottom button onto the button band. With wrong sides together, fold the button band in half, with backs of the sewn-on buttons touching each other. The fold becomes the halfway point between top and bottom. Mark that fold with a pin, or actually sew on the middle button. For your 7-button example, all you now have to measure is the distance between the middle button and either the top or bottom button, and determine the even spacing for two buttons between the existing button marks. As already noted above, it is important for a button to be at the full-bust point, for those who are well-endowed, and the button placements (and, perhaps, the number of buttons) will need to be adjusted accordingly. Welcome back to the blog; you two have been sorely missed! YOU ARE A FREAK! But I love your method. No counting or measuring! I’m so wedded to counting because it helps me do the button holes in the exact right place by counting the rows as I knit. But you could still place them your way, and THEN count and THEN knit the button band. I’ve never tried it for a knit cardigan, but I inherited a nifty sewing tool that does buttonhole spacing, I know it works for sewing, so maybe I’ll give it a go for my next cardigan. Well, the elastic dots and stretch method beats mine. I would cut a piece of paper and do even folds. Or measuring. Or use my eyeballs. THEN, very importantly, I would mistrust myself or get clever about where to nestle the buttons and sew them on a little bit…still…wrong.